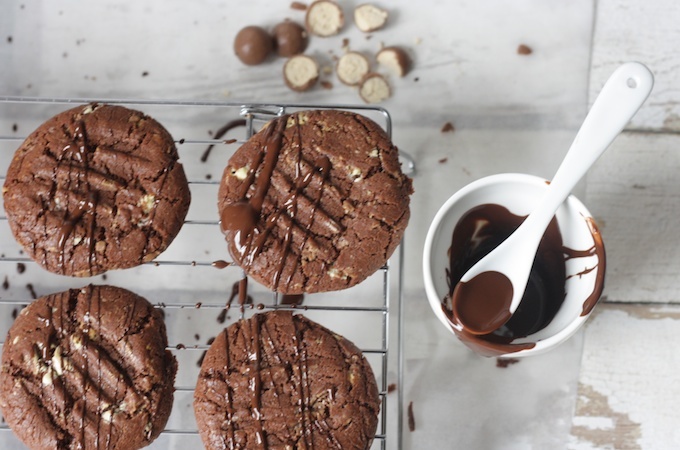 Crispy on the outside, crazily chewy on the inside, dark chocolate, white chocolate, maltesers – there’s so much going on in these cookies they’re an absolute joy. I was tasked with making a dessert for a firework party this weekend, and after leafing through Jamie Oliver’s Comfort Food cookbook, I decided that hand-held baked treats would be the perfect party food. I’ve had Comfort Food for a while, but never done anything more than drool over the recipes, so it was good to finally make something from the book. Jamie’s recipes are a safe bet when it comes to crowd-pleasers, so you know you’re in good hands. The cookies are simple to make, so are a great bake for the littlies to get involved with. Whether it’s breaking up the chocolate to melt, crushing the maltesers or drizzling chocolate over the top, there’s a job for everyone. You could also package some up in clear bags with pretty ribbons or put them in a funky tin to make edible gifts. I’m really missing the amount of time I spent cooking and baking, so it felt good to steal away an hour or two in the kitchen for a spot of baking. I know some people find cooking a stressful task, but for me it will always be how I unwind. Plus I particularly love cooking for an occasion – especially a party! The kids were all rushing around in a frenzy, only pausing briefly to grab a cookie out of the tin before continuing with the important business of waving sparklers around, jumping on the trampoline and playing football (not all at once I might add). 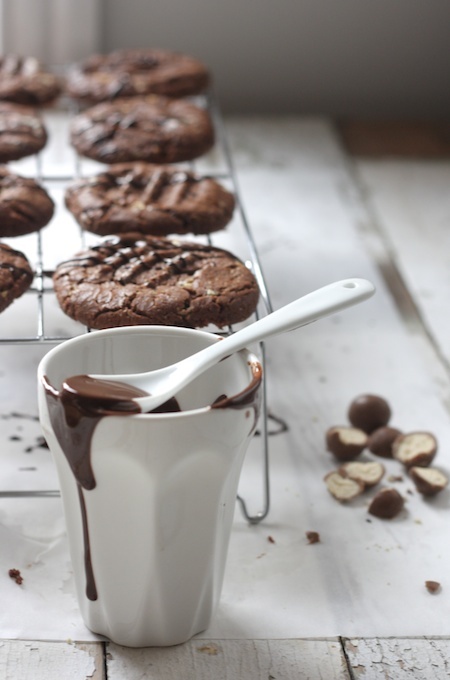 Oh wow, these could be the ultimate chocolate cookie. I need to bake these with my three and think they would make a perfect edible gift too. Love you knew look here, and these photos are gorgeous too! Yes I wouldn’t look too long Sarah… I can’t be held responsible! I don’t use malt enough in my cooking, which is daft as I love the depth of flavour it brings. Really like the sound of these. It’s such a delicious recipe Kavey… a touch of malt powder and all those crushed maltesers… so good! Those look insanely good Katie!